The stable enjoyed a good day at Caulfield on Saturday, Black Tomahawk a gutsy winner of the Listed Harry White Classic whilst Tulsa and Extra Noble showed that they are on target for spring aims with eye-catching placings. Alaskan Rose unfortunately did not have a great deal of luck but thankfully despite running into trouble pulled up with only a minor issue - "we will just put a line through that run and press on," Michael Moroney said. Delighted with the black type victory for Black Tomahawk, Moroney noted that it was an outstanding ride by an in-form Glen Boss. Settling midfield in a slowly run race, Black Tomahawk took off with 800m to go, taking an early lead and giving a lovely kick in the run home - having his rivals covered a long way out. "They were having a picnic out in front," Boss reported, "and I did not want to come back after a nice fifth and say they just went to slow." "It was exactly how we wanted him to be ridden," Moroney said, agreeing with Boss' summation that Black Tomahawk is a horse who needs to wind up. "He just hits this flat spot for 150m or so," Boss said, "but comes out the other side of that hitting the line strongly." "So I wanted him to be hitting that flat spot a long way from home instead of in the straight." Whilst Black Tomahawk has in the past been at his best on rain affected going, Moroney thinks that over trips he is just as capable on good tracks. "He has just wanted a bit of ground," he said, adding that the Lavazza staying race on Melbourne Cup Day is a great aim for the consistent six-year-old. The winner of four of his 19 starts and over $140,000 in stakes, Black Tomahawk was bred by his very proud part owner Sylvia Mooney who also bred the gelding's metropolitan winning half-brother Spirited Will and the city placed Mr Satnav. Foaling a Skilled filly last spring, Black Tomahawk's city winning dam Willisa is a full sister to the nine times winning stayer Impulsive Risk out of a mare whose dam is the legendary stayer Reckless. It is great being in winning form during the spring and we are looking forward to cheering on another couple of nice types this week; Sound Works at Kembla Grange on Tuesday and Wichita Woman at Ballarat on Wednesday. Debuting on the back of a couple of nice trials in Sydney, the Not A Single Doubt filly Sound Works has been a little green but we are expecting a bold showing from her in the 1000m maiden with Kerrin McEvoy to ride. "She is a really nice filly," Moroney enthused. "She just wanted to over-race a bit in her last trial but hopefully she relaxes a bit more this time as on what she has always shown she should prove hard to beat." 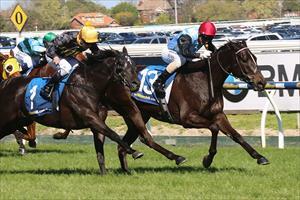 Wichita Woman, who contests the 1600m maiden at Ballarat with Michael Walker aboard, also looks a top chance. Finishing off nicely after swinging out wide at the turn when debuting over 1400m at Pakenham a few weeks ago, she faces a stronger maiden this time but she has, says Moroney "come on a lot." And, being by High Chaparral out of a Zabeel mare, Wichita Woman looks nicely place dup to the mile at her second go.